Volunteer UK; Anson instructor. Anson N9718 of No 2 AFU, flown by Sgt Deane crashed 1/2 mile from Millom Coast Guard Station at 0030hrs on 22 Sep 1943. All 5 crew members perished. Buried Chester (Blacon) Cemetery, Chester; Sect A, Grave 501 – Son of Fredrick Gustave Wooding Deane and of Maud Gorring Deane (nee Batson), of Barbados. 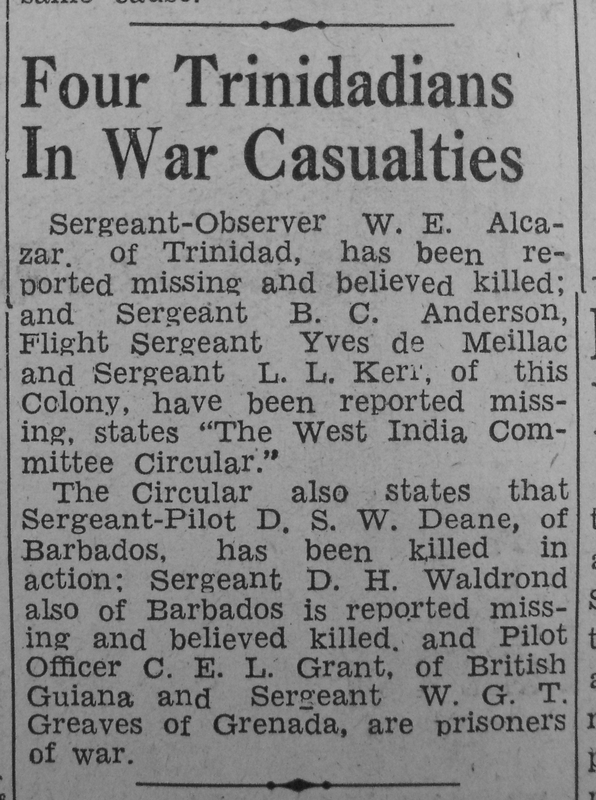 Additional information: Son of Fredrick Gustave Wooding Deane and of Maud Gorring Deane (nee Batson), of Barbados. Grave/Memorial Reference: Sec. A. Grave 501. Anson of 2 AFU serial N9718 crashed into sea off Millom Coastguard Station, Cumberland. Also killed: L.S. Gibson, RCAF J/27481 – D. Clayton, 1288501 and W. Dowling, 1562767. DSW Deane cousin to Charles Parnell King and DSB Davies. Enlisted in Trinidad and qualified as a Pilot. On arrival in the Uk he was attached to an OTU Special Observers Training School. On an evening training Mission on coming to land. the runway had changed and the Pilotwas unable to gain sufficient hight and consequently crashed in the nearby sea. ALL occupants died in the Crash. Son of Fredrick Gustave Wooding Deane and of Maud Gorring Deane (nee Batson), of Barbados. My Grandfather was Fredrick Gustave Wooding Deane, from Barbados, any information about the family history would be most welcome, and of great help.